A new survey has shown that the world’s sandy beaches have grown slightly over the past three decades. But researchers also observed a troubling trend in protected marine areas. 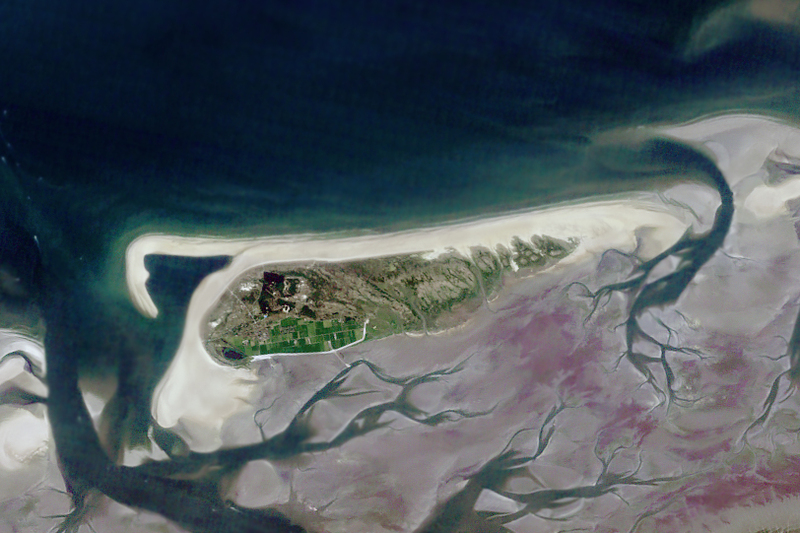 A team of researchers from The Netherlands used machine learning to accurately identify sandy beaches in images taken by Landsat satellites. 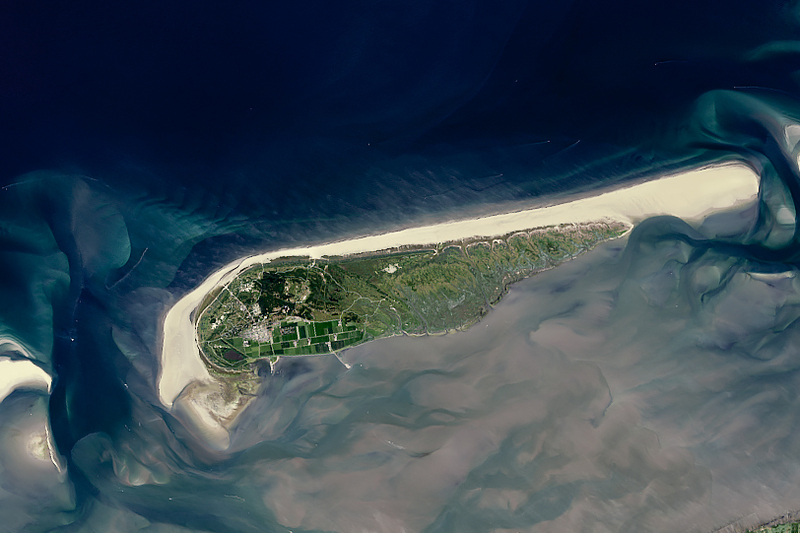 They “taught” their image-classification software to automatically determine whether beaches around the world were sandy, rocky, or icy, and then to examine how the sandy beaches changed between 1984 and 2016. 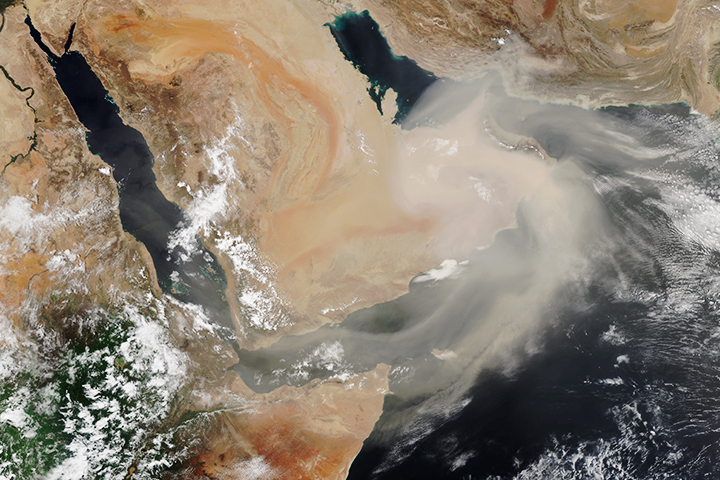 The team found that about 31 percent of the world’s coastlines are sandy. Africa has the highest proportion of sandy beaches (66 percent) and Europe has the lowest (22 percent). Thy also found that 24 percent of those sandy beaches—a coastline distance of almost 80,000 kilometers (50,000 miles)—had eroded at rates exceeding 0.5 meters per year. Another 28 percent of sandy beaches had accreted (grew), while 48 percent remained stable. Four of the seven largest erosion hot spots in the world were located in the United States. The image pairs on this page show two of the extreme cases. 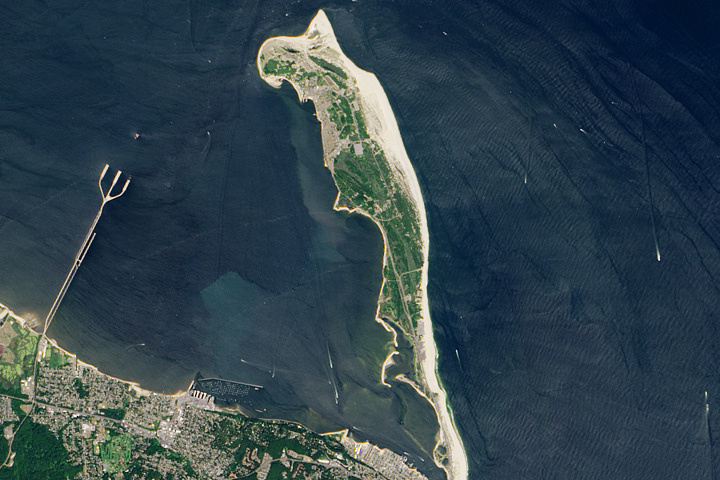 The beaches at Schiermonnikoog, The Netherlands (above), were among the fastest growing in the study, with growth of nearly 10 meters per year. 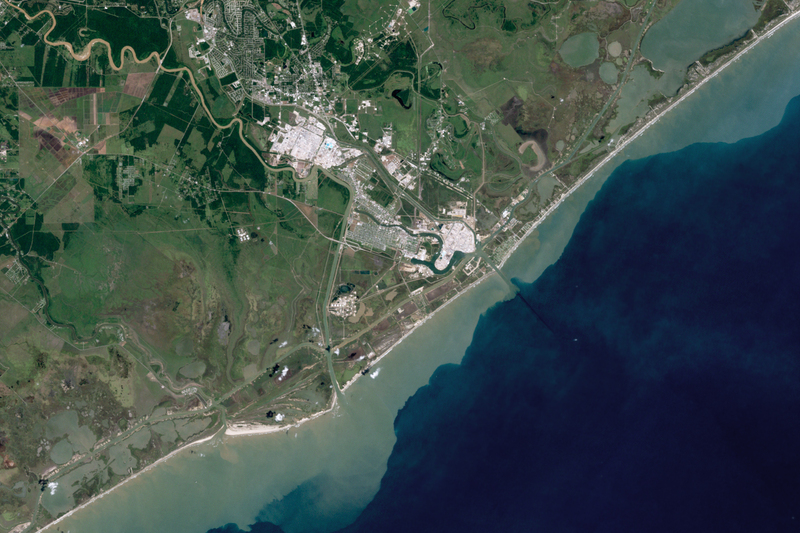 The area just south of Freeport, Texas (below), is one of the largest erosive hotspots in the world, with beach being lost at a rate of nearly 15 meters per year along a 17-kilometer (11-mile) stretch. 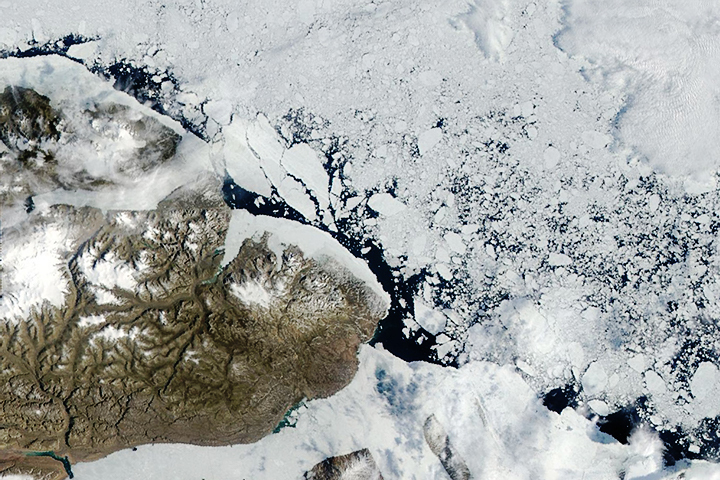 These natural-color images were acquired by the Thematic Mapper on Landsat 5 and the Operational Land Imager on Landsat 8. Human activities have sped up erosion and accretion for a variety of reasons. Sand mining in Vietnam’s Mekong Delta has caused high rates of erosion that could jeopardize this biologically diverse region and threaten the sustainability of its fishing industry. On the other hand, the Tweed River Entrance Sand Bypassing Project in New South Wales, Australia, pumps sand from the Tweed River to three beaches in Queensland, enlarging those beaches and improving navigation at the river mouth. The researchers were troubled by their observation of marine protected areas. 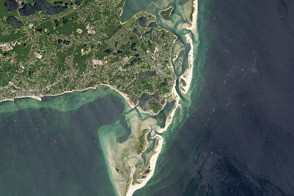 About 32 percent of the coastline in these sanctuaries, reserves, marine parks, and wildlife refuges are sandy beaches. Nearly 37 percent of those “protected” coasts are eroding at rates exceeding 0.5 meters per year; about 32 percent of marine protected beaches are growing. Since these areas should be beyond human intervention, it is not clear why these beaches are shrinking. 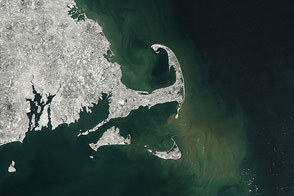 NASA Earth Observatory images by Lauren Dauphin, using Landsat data from the U.S. Geological Survey. Story by Jessica Merzdorf, NASA’s Goddard Space Flight Center, with Mike Carlowicz, NASA Earth Observatory. Sandy beaches are growing in some parts of the world and shrinking quickly in others, including one-third of marine protected areas. Luijendijk, Arjen, et al. (2018) The State of the World’s Beaches. Nature Scientific Reports, 8. NASA Earth Observatory (2017) World of Change: Coastline Change. 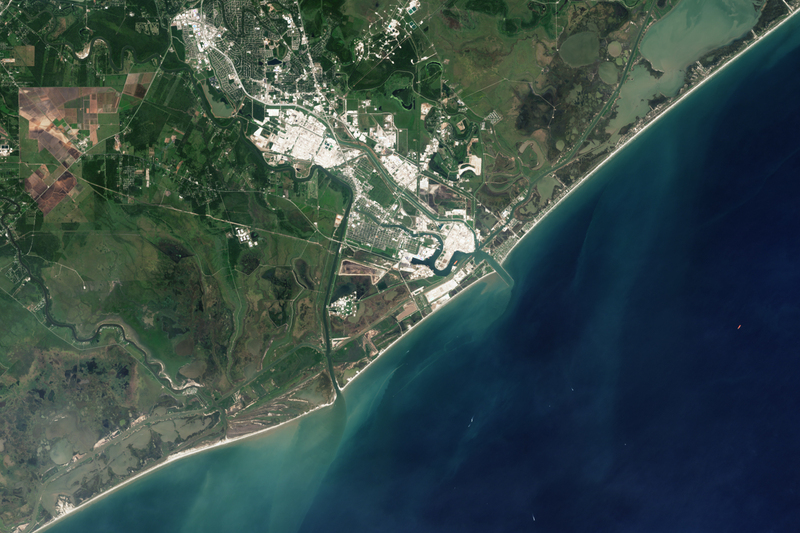 NASA Earth Observatory (2011, June 3) Barrier Islands Off Brazil.